On this 2 hour walking tour you will stroll down through the core of medieval Madrid accompanied by a guide. The winding streets of the Arch of Cutlers will lead you to some of the oldest buildings such as the house and tower of Lujanes where the King Francois I of France was held prisoner. You are offered several options to end the tour, combined with a visit to El Prado Museum, the Royal Palace, a traditional Flamenco show, or with some Spanish delicious tapas. 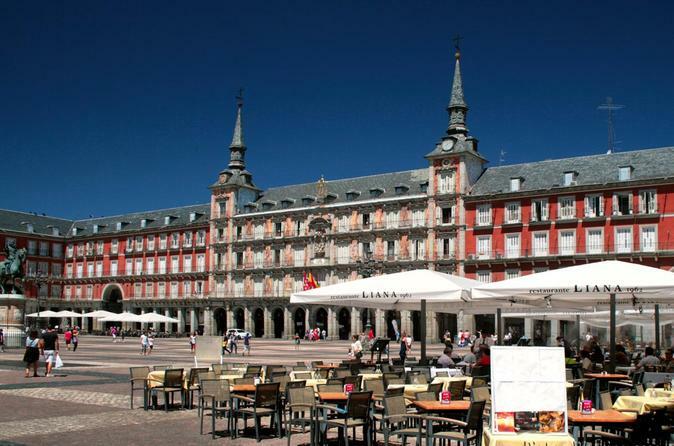 First, you will visit the “Madrid de los Austrias” (Royal Habsburgs), the Plaza Mayor and cross the Arc of Cutlers, which is one of the nine ports of the Plaza Mayor. You'll continue through the ancient winding streets around, and will head towards the nearby Plaza de la Villa, the core of the medieval Madrid. Here we will admire some of the oldest buildings in Madrid. Such buildings as the Casa de Cisneros, Lujanes, and the Casa de la Villa, which has been the city hall of Madrid up to year 2007. From the Plaza de la Villa, it's time to continue to walk towards Bailen Street, where you'll see the exterior of the Almudena Cathedral, and its neoclassical architecture. A little further on is the Royal Palace, which you will see from the south and east side, and finally finishing your walk in the Plaza de Oriente, where the statues of the old kings stand. Besides de Royal Palace, we also have the Royal Theater or “Opera”, in Plaza de Oriente. Now that you're at the end of your tour, you have several options: a visit to El Prado Museum, visiting the Royal Palace, attending a traditional Flamenco show, or with some Spanish delicious tapas for a quick bite.